On October 24th 2014, Dr. Ian Johnson attended the launch of the Humanities Networked Infrastructure (HuNI). As part of the launch, and to demonstrate Heurist’s ‘database-on-demand’ service to this project, Ian was asked to set up a database using a data-dump from an existing online database (The Ultimate Gig Guide) and export it for harvesting by HuNI. Receiving the data on a Monday, Ian had imported it into a database set up using the HuNI Core template and had written the harvestable XML files by Tuesday. 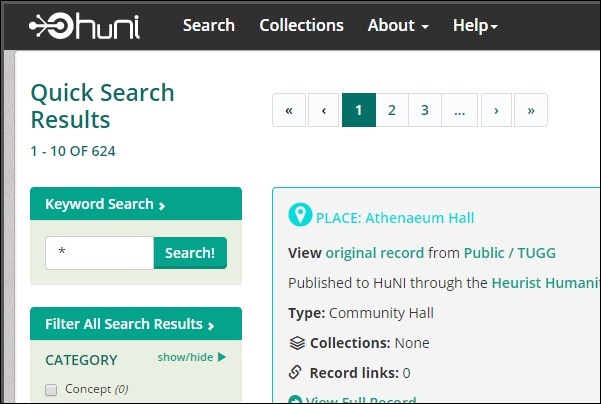 The Huni Technical Team then imported the data and made it available to the HuNI search interface by the Thursday. This exercise showed the complete ‘database-on-demand’ cycle from a third-party database through Heurist to HuNI over four days of occasional work. The HuNI Project Manager said afterwards ‘I can’t believe you pulled this off so quickly’.